Nellore recorded the highest number of lightning strikes at 11,955, Prakasam at 4,725, Srikakulam at 4,703, Guntur at 4101, Vizianagaram at 3901, East Godavari at 3216, Krishna at 2925, Visakhapatnam at 2698, Chittoor at 1706, West Godavari at 768 and Kadapa at 327, a release said. Amaravati: As many as 14 people were killed in 41,025 lightning strikes in different districts of Andhra Pradesh, the state Disaster Management Department said today. On Tuesday, Guntur district recorded the highest number of deaths at six, followed by Vizianagaram at 3, West Godavari at 2 and Srikakulam, Visakhapatnam and East Godavari at one each, a release from the department said. 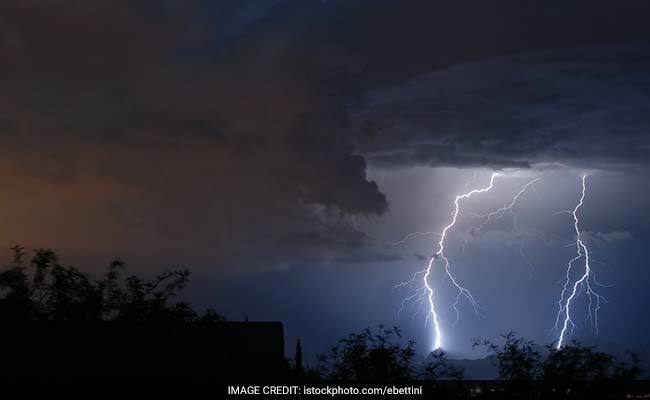 Cloud-to-ground strikes happened in 11 out of 13 districts till 11.40 pm on May 1, the release said, citing reports from Earth Networks, which operates weather and climate sensor networks worldwide. Nellore recorded the highest number of lightning strikes at 11,955, Prakasam at 4,725, Srikakulam at 4,703, Guntur at 4101, Vizianagaram at 3901, East Godavari at 3216, Krishna at 2925, Visakhapatnam at 2698, Chittoor at 1706, West Godavari at 768 and Kadapa at 327, the release said. "Owing to sudden change in weather, heavy rain and strong gales occurred in the Bay of Bengal. That had caused the lightning strikes and loss of lives," it added. Due to whirlpool formation, two fishermen were reportedly drowned in the sea, it said. The state Marine Police and the Coast Guard were continuing the operation to trace the bodies. Meanwhile, five fishermen boats that went missing in the sea, returned to shore safely today.